Am I being pc because this guy makes me wince? "What's so tragic about a 6.6 per cent jobless rate anyway?" asked Bank of New Zealand economist Craig Ebert. Ex Treasury. Bloodless. Yeah, yeah and I'm a bleeding heart. Mr Ebert obviously doesn't have friends or relatives who have lost jobs or businesses. "A lot of countries would give their eye teeth for that sort of level, albeit we should hope for something a bit lower in due course. For a truly stuffed labour market, and economy, go back to the early 1990s, with 11.2 per cent [unemployment]." Mr Ebert doesn't look old enough to have actually experienced the early 1990s. For the first time in my life I couldn't get a job and it is a most depressing, but empathy-building experience. What really pisses me off is this supercilious attitude is what gives capitalism a bad name. Thoughtless prick. It never ceases to surprise the lengths socialists will go to to exploit events. Even natural disasters. A fanfare was made yesterday about a further $55 million available to subsidise young people into jobs or training. It is unpopular to argue against this initiative but I will. 1/ Primarily any subsidy distorts the labour market. As do legislated minimum wages. The first assists the employer and the second penalises. I am surprised the anti-capitalist Greens aren't arguing against the (0n-going) subsidy. Sue Bradford used to rightly argue against WFF on the basis that it subsidises employers. 2/ Subsidies favour one and punish another. The potential worker who attracts the subsidy takes opportunity away from the potential worker who doesn't. Probably an older Maori or Pacific worker with greater financial committments than the young person. 3/ There are around 64,000 (15-24) young people officially unemployed. 1,000 subsidised positions tackles only a small percentage. It is an inefficient use of taxpayer's money to solve the problem of youth unemployment. 4/ What 'can't be seen' is as usual ignored. That $55 million is taken from taxpayers who might have used it to invest in their own economically constructive ways. 5/ Yes. If youth are going to be paid the dole it is better to get something for the money. Which simply avoids debating whether or not youth should even be paid the dole having contributed nothing to the economy thus far. Why shouldn't they remain the responsibility of their parents? Afterall, their parental income is relative when it comes to qualifying for a student allowance. Why isn't the same criteria applied to the unemployment benefit? 6/ Some employers will abuse the subsidy, especially when the government demands they pay inexperienced workers a minimum rate. The criteria that jobs must be "opportunities that wouldn't exist if the Job Ops subsidy wasn't available" is a test easily met. 7/ Industries that can only employ skilled workers are disadvantaged. 8/ There is inherent unfairness in expecting one young person to pay for their own skills acquisition and subsidising the next. 9/ Subsidies should be no part of a policy programme run by a free enterprise party.If they are wrong in principle then ...they are wrong. Sneaking them in here and there to look like they are 'doing something' is an abrogation of their responsibility to introduce better policy. Like low flat tax and labour market regulation reduction. Typically National. Americans depended more on government assistance in 2010 than at any other time in the nation's history, a USA Today analysis of federal data finds. The trend shows few signs of easing, even though the economic recovery is nearly two years old. * A record 18.3 percent of the nation's total personal income was a payment from the government for Social Security, Medicare, food stamps, unemployment benefits and other programs in 2010. * Wages accounted for the lowest share of income -- 51.0 percent -- since the government began keeping track in 1929. From 1980 to 2000, government aid was roughly constant at 12.5 percent. Nothing much captures my imagination today. Perhaps worth a mention is National's replacement for John Carter's safe seat. Mike Sabin, the ex-policeman who wages war against P. His anti-drug advocacy doesn't stop at P.
"New Zealand ranking second only to the United States for cannabis use provides further evidence that our country is descending into the world's gutters," Mr Sabin said. I wonder if National has a seat they can offer to Doug Sellman? What percentage of teen mothers go on to have 2 or 3 children while staying on the DPB? It is impossible to answer the question based on the information MSD can provide due to a lack of historical data. 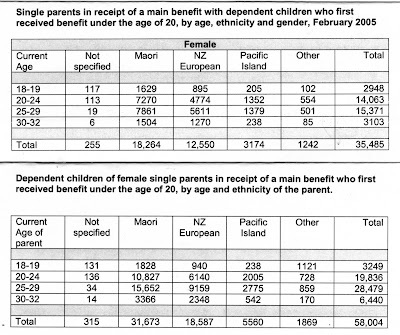 The above tables would indicate that 35,485 mothers (or female caregivers) aged 32 or less who started on welfare as a teenager had 58,004 children. Some may have added 1; others more, so it is impossible to tell from the above data a specific percentage. 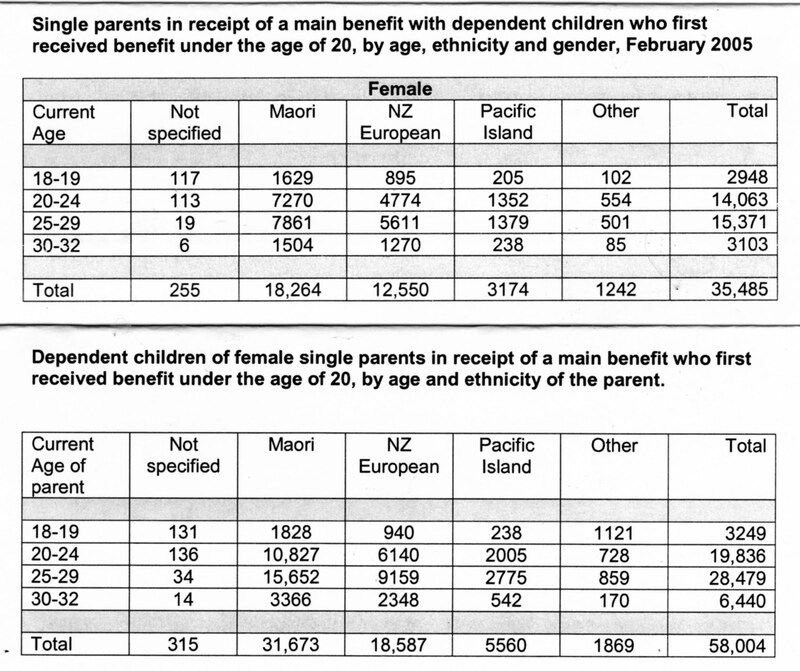 But it is clear that Maori and Pacific mothers are considerably more likely to have additional children on a benefit. There are also a number of other unknowns about the data for instance the dependence on a benefit may not have been continuous. And a very small number might be dependent on a benefit other than the DPB.